handbill designed by the ever talented Andy Scott. 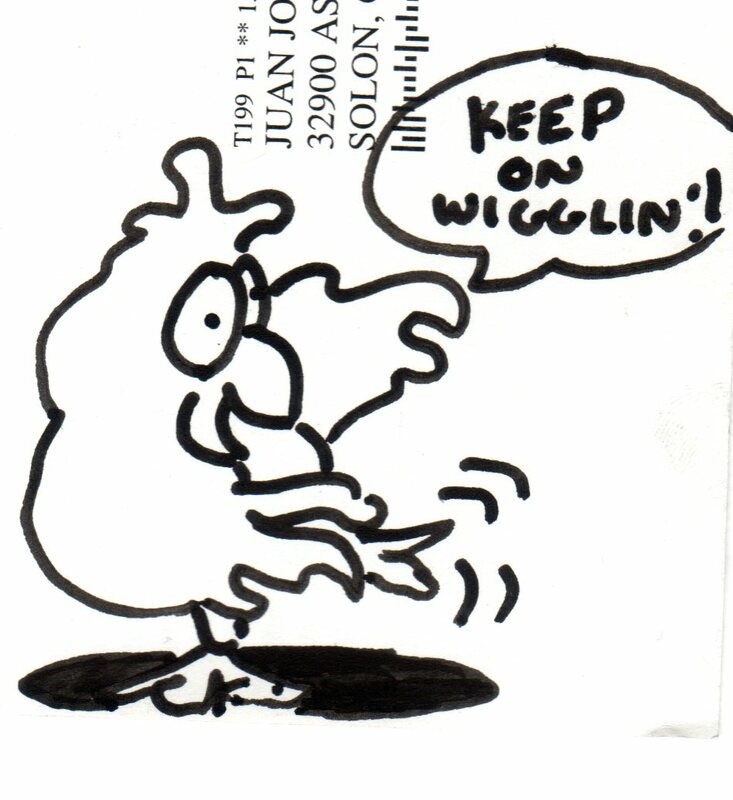 Exciting times are upon us, denizens of the crinkled realm. 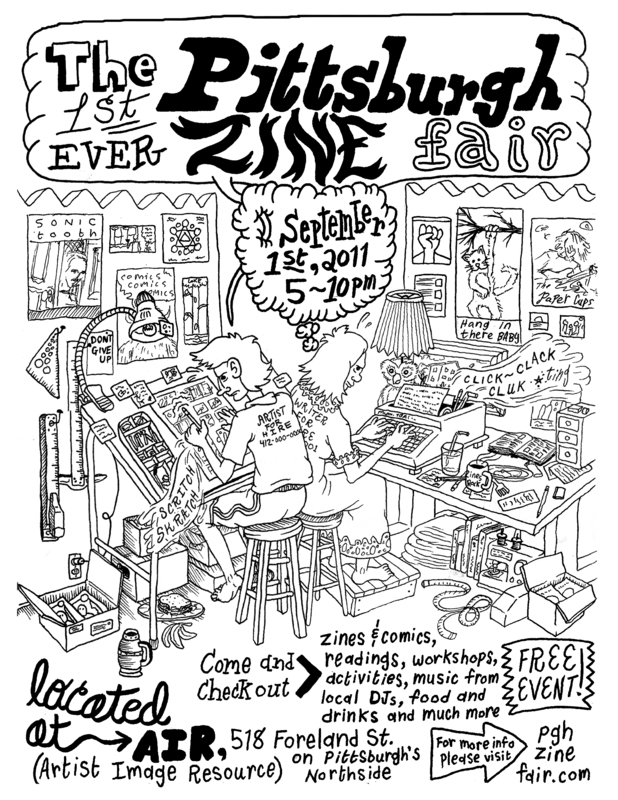 The Pittsburgh Zine Fair is being held for the first time ever on Thursday, September 1st from 5pm-10pm. The Zine Fair will be held at A.I.R. (Artists Image Resource) in the North Side and will feature over 30 vendors, workshops, hands-on demonstrations on letter-pressing and screenprinting, readings, and discussions! AIR’s 10,000 square foot facility includes an Intaglio (etching) shop, a Lithography shop, a Screenprinting shop, a Digital Imaging lab, exhibition and archive spaces. AIR provides a resource for work in relief, intaglio, lithography, screenprinting, digital imaging, photography, bookbinding, papermaking, letterpress and other related arts. Artists Image Resource is located at 518 Foreland Street, Pittsburgh Pennsylvania 15212 (in the Northside). CCS App comic scanned: Must be touched up a little more. Everyday, a little more gets accomplished. The physical comic now exists digitally (Enjoy it at your leisure.) I learned my lesson from the previous Bü Kowski story and have made sure that the flow of pages makes sense on your computer monitors. 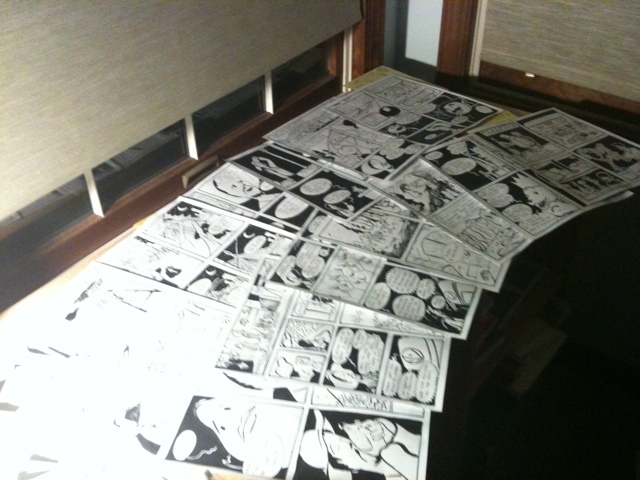 In Pittsburgh I’ll be printing the comics, seeing as how the printer here in Cleveland isn’t the hottest on the block. Good enough to make a prototype, though. It will be printed on a soft sandy colored paper to further the agricultural theme. For the moment being, the title page is a placeholder. I’m working on a cover and back cover the run more in line with the black and white contrast of the rest of the story. Additionally, the title is just going to be “Stori”. Tomorrow, my dad is taking the day off from work and I’ll be taking my day off from comics to spend time with each other, so don’t expect too much from me, maybe just the final retouching of the strip in Photoshop, but I bet you won’t notice many of the differences. -a short story told in pantomime entitled Polar Bear Protector. It’ll be my first work in color. The high hope would be for it to be silk screened with two colors, light blue and black. -a Kama Sutra of my own made using accordion folds. Oh and if you know of any good online tutorials for Illustrator, shoot ’em my way. Until then, I’ll be watching assorted youtube videos, developing the most haphazard work practices possible.